Today we honor all the men and women who have served in the nation's armed forces, THANK YOU for our freedom. 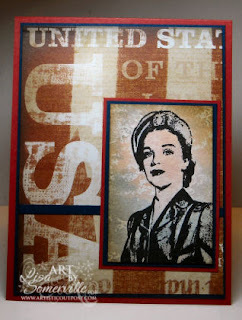 Inspired by CPS141, I used images from the Hero and She-roes Plates from Artistic Outpost. To add color to my images, I morphed the Watercolor Distress Technique from a past TJNL issue, by coloring my images with Ranger Distress inks, after the WCD Technique was dry. The beautiful pattern paper behind both images if from Karen Foster Designs. Have you read about Operation Holiday Hero's? 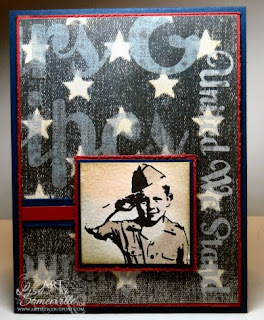 My friend Selene is organizing an event to create cards to be sent to the troops. How can you help? If you live near Selene you can join her in creating cards. Not local? She can use still use your help! You can send completed cards, card fronts, envelopes, postage and card stock to be used in assembling cards to be sent to the troops. WOW, both cards are fabulous. I hope to see them published somewhere. A beautiful display of courage and love of our Country! Kewl paper. Wow! These are beautiful! P.S. I didn't get your email for some reason.. Can you resend? Love these cards! Thanks for posting them! What a work of art. Love everything about them. Wow! These are all so inspiring! What a lovely way to honor our nation's heroes, current and past. I'll be spending Veteran's Day with my son, who recently completed his service in the Marine Corps. Your cards are just wonderful! What fantastic cards these are Lisa!! I love the vintage feel and the poignant emotions that they raise when you think of all the troops have done for your country over the years.